In 2011, the City of Scottsbluff was awarded a grant through the Greener Nebraska Towns Initiative. 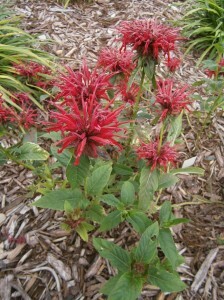 The grant is funded by the Nebraska Environmental Trust and administered by the Nebraska Forest Service and Nebraska Statewide Arboretum. This grant has made several demonstration projects possible throughout the City, and one of these projects was recently completed. This project included an extensive tree planting demonstration and a series of three rain gardens designed to capture and infiltrate polluted stormwater runoff. In spite of having less than a third of our normal moisture for the year, the rain garden at the Scottsbluff Public Safety Building is looking great! 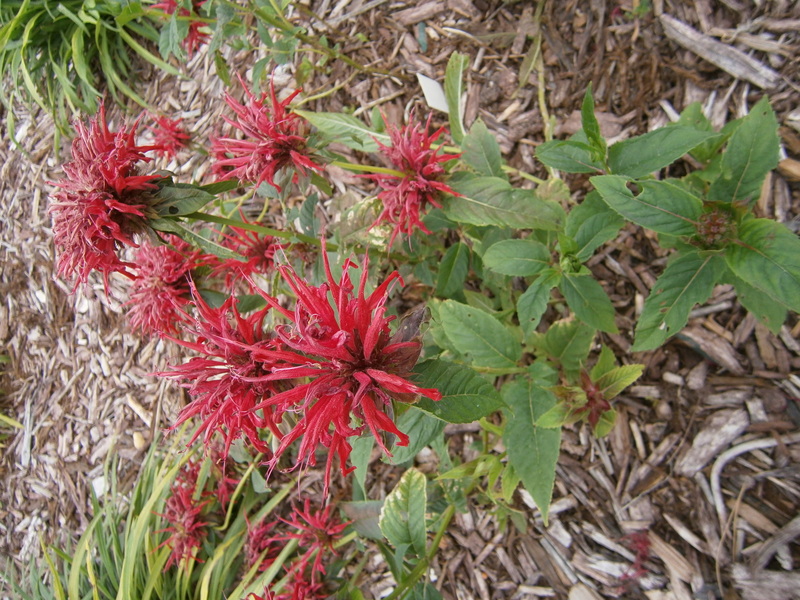 The Bee Balm is the only thing in bloom at the moment, but the rest of these plants are doing very well and we should start seeing more of them bloom soon! 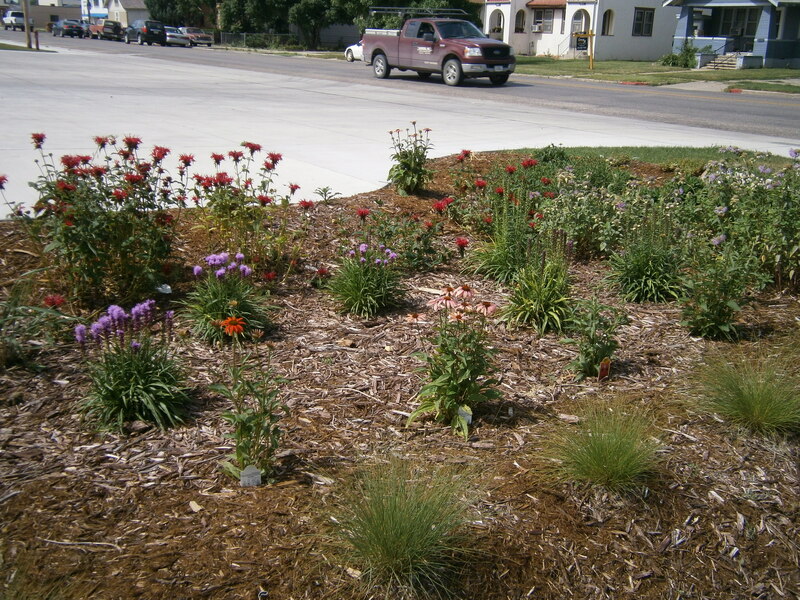 There are many different native or well-adapted plants that can be used in rain gardens in Nebraska. 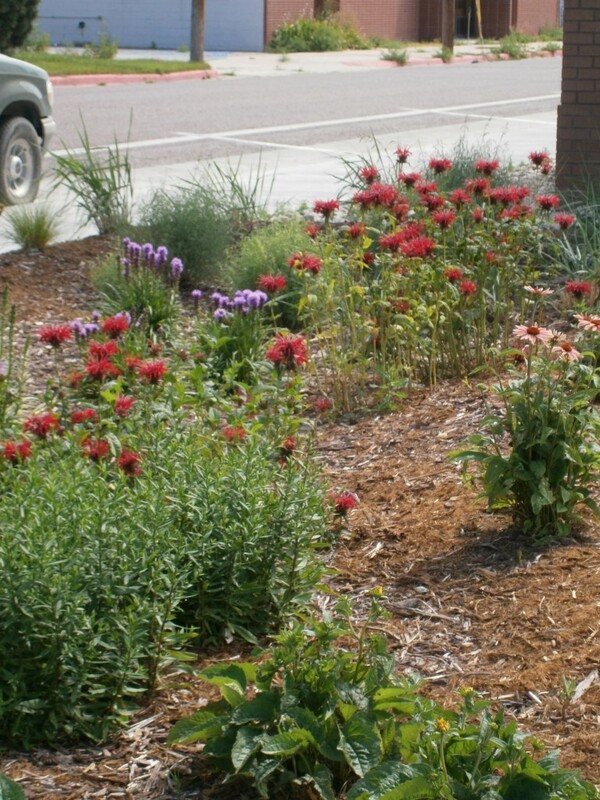 Below are a few that we have used here in Scottsbluff that have done very well in our rain garden. 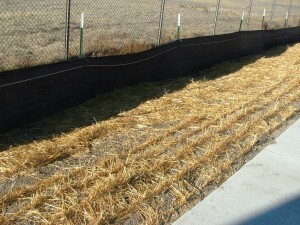 This straw mulch has been crimped into the ground for temporary stabilization. Stabilization, or establishing ground cover to protect disturbed soils from erosion, is not only a good practice, it is required by law. 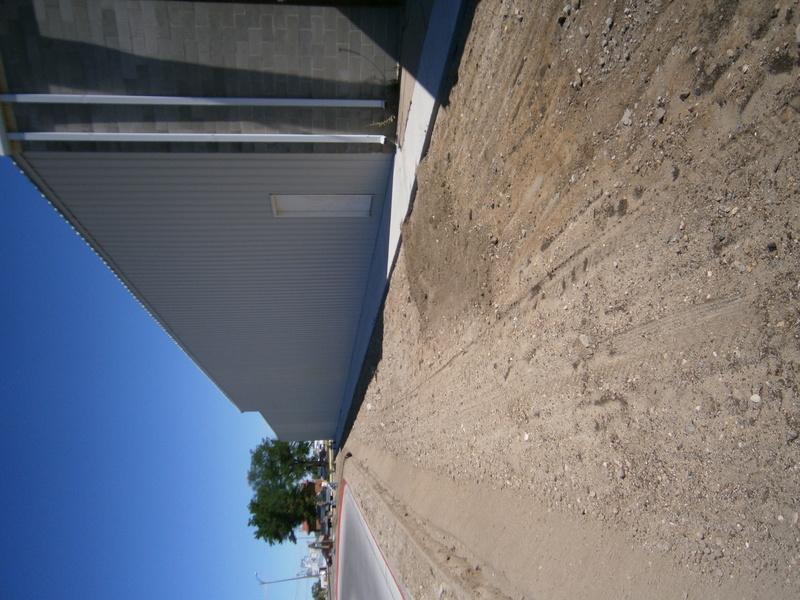 The Nebraska state Construction General Permit states that, with a few exceptions such as snow cover or frozen ground conditions, “stabilization measures must be initiated as soon as practicable in portions of the site where construction activities have temporarily or permanently ceased, but in no case more than 14 days after the construction activity in that portion of the site has temporarily or permanently ceased.” Since it is unlikely that suitable vegetation can be established within 14 days, other methods of stabilization must be considered. Covering exposed or disturbed areas protects the soil from raindrop impact, slows the flow of and infiltrates stormwater, and protects newly seeded areas. It also helps retain soil moisture, which will help your vegetation become established more quickly. One of the simplest methods of erosion control is mulching. Straw or hay mulch should be applied at a rate of 2-3 tons per acre. To provide good ground cover, at least 50% of the mulch should be ten inches in length or longer. The mulch should be crimped using a weighted roller that anchors the mulch into the soil. If the area is seeded before the mulch is applied, this can be a very simple and effective method of preventing erosion while vegetation is established. Another method of erosion control is a rolled erosion control blanket. These can be made from natural or synthetic materials and can be effective in protecting steeper slopes from erosion. They are designed to be rolled onto the area and stapled into place. Always follow installation specifications, as poor installation can cause these products to fail. This erosion contol blanket temporarily stabilizes the slope while vegetation is established. If the blanket is not properly anchored and stapled, it can either be washed away or stormwater can wash out soil underneath the blanket, causing small gullies that are difficult to seed. 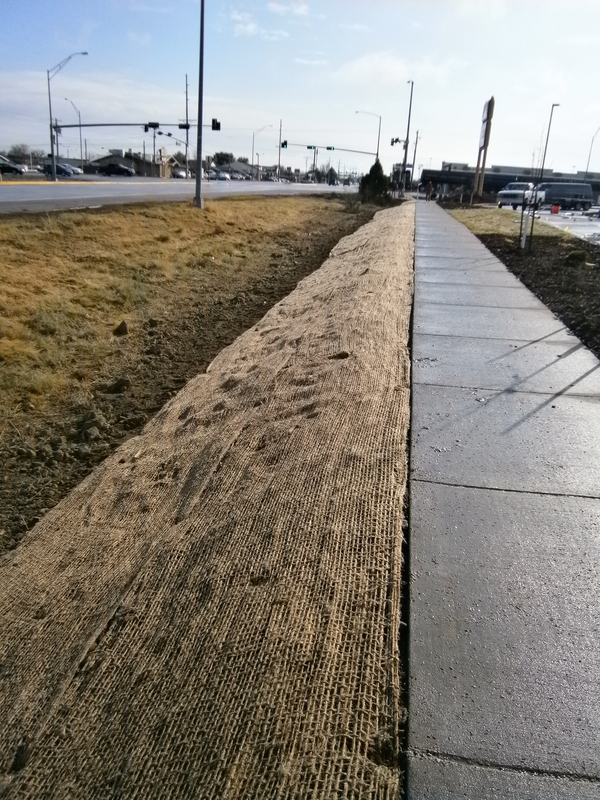 If the area is seeded and the erosion control blanket is installed correctly, grass will grow up through the blanket, and over time, the blanket will degrade. For extremely steep slopes or areas with limited access, hydraulic mulching should be considered. In this process, a slurry made up of mulch, seed, and a tackifying agent is sprayed onto the disturbed area. There are also many other products and stabilization methods available. Each site should be carefully evaluated to determine which product or combination of products is the most effective and economical way to achieve stabilization. If you have a stormwater permit (state or local) in your name, it is very important to close out that permit upon completion of a project. As long as that permit is open, you are the responsible party for any stormwater discharges coming from your site. A permit may be closed out under only two circumstances: either final stabilization must be achieved, or the permit must be transferred to another Operator or the Owner. Under the first circumstance, coverage under a NPDES construction permit may be terminated 180 calendar days after all soil disturbing construction activity has been completed, final stabilization has been achieved, and all temporary BMPs (silt fence, inlet protection, etc.) have been removed. 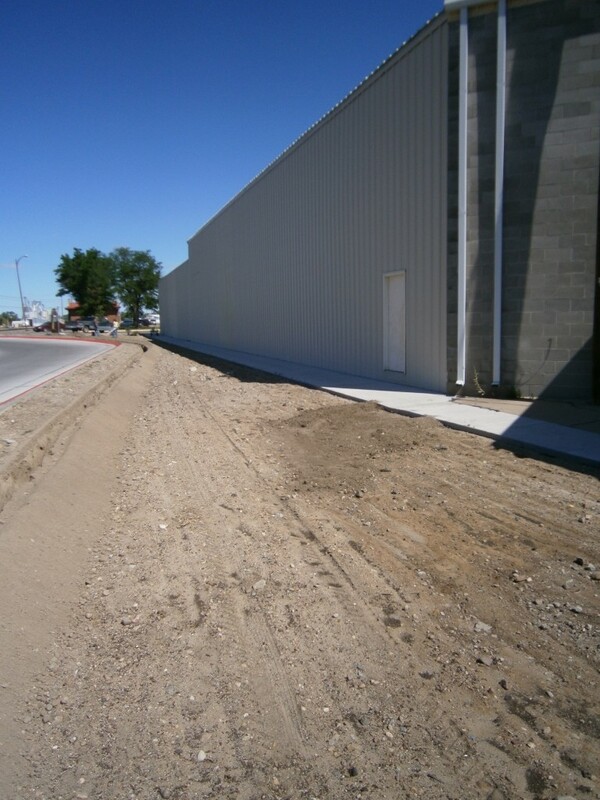 In order for a site to be considered stabilized, any areas that are not impervious (covered by buildings or pavement), must be vegetated with 70% perennial groundcover. Annual vegetation, such as cover crops, do not count as final stabilization. A simple test to see if you have 70% vegetation is to take a 100 foot long tape measure, lay it out over an area that is representative of the whole site, and count how many plants (in most cases blades of grass) coincide with the 1-foot marks. If there are plants at 70 or more of these marks, then you have the required stabilization. After final stabilization has been achieved for 180 calendar days, you may then file a Notice of Termination (NOT) which will terminate your permit coverage. The alternative method of terminating permit coverage is to transfer the permit to another Operator or the Owner. In order to do this, you must file a Construction Storm Water Notice of Transfer (CSW-Transfer) that lists the current permit authorization number and the portion of the project that is to be transferred. It is possible to retain responsibility for only part of a project, but to transfer a portion of the project to the new owner. The person to whom you are transferring the permit is then required to submit a Notice of Intent (NOI) to the state, and the current permittee may now file an NOT. There is often some confusion over who is eligible to take over responsibility for a Construction General Permit. The permittee must be either the owner or operator of the site. This means that the general contractor for a project is eligible to hold the permit. If for some reason the general contractor changes during the course of the project, the permit may be transferred to the new Operator. However, subcontractors, such as landscapers, are not allowed to take responsibility for the permit, because they do not meet the definition of “operator” for the project. If a contractor’s portion of a project is complete and they want to terminate their permit coverage before final stabilization is completed, then their only option is to transfer permit coverage to the owner. The new permittee will then be responsible for all inspections and best management practices required by the Construction General Permit. If you ever have any questions about the permitting process, contact your local stormwater coordinator. Contact information for the ten communities in NebraskaH2O can be found under the Communities tab on this website. This is an effective, inexpensive concrete washout. For obvious reasons concrete trucks should never be washed out into the street or into the storm drain. Solids that are washed out of the concrete trucks can clog storm drains, causing flooding and expensive clean-up. However, it is also important to contain the concrete wash water as well. The wash water is very alkaline, which means it has a very high pH. Water must have a pH in the range of 6.5-9.0 in order for aquatic life to survive. Concrete wash water typically has a pH of 12 or above. Furthermore, the pH scale is logarithmic, meaning that a pH of 12 is 10 times greater than a pH of 11, 100 times greater than a pH of 10, and 1000 times greater than a pH of 9.0, which is the highest level of alkalinity that aquatic life can tolerate. If allowed to escape the site, concrete wash water can have a severe effect on our streams and rivers. Other significant pollutants in concrete wash water are heavy metals such as chromium. If wash water that is high in heavy metals leaches through the soil to the water table, it can contaminate our groundwater, which is where most cities in Nebraska get all of their drinking water. Concrete washout is also high in suspended and dissolved solids. The average stream or river in the United States typically has a suspended solid count of no more than 60 parts per million (ppm). The average suspended solids in concrete wash water is 27,000 ppm, well above the range at which aquatic life can survive. 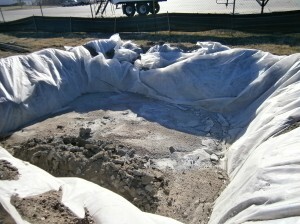 Luckily, it is not very difficult to control concrete washout on your construction site. There are several different ways to build a concrete washout facility, the most simple being to dig a pit and line it with plastic sheeting that is at least 10-mil thick. If you don’t have a good location on your site for a facility like this, you can also build a portable facility by building a box with a liner to contain the washout. There are also several products available for purchase that are effective, portable concrete washout containers. Always locate concrete washouts as far away from storm drains as possible. Make sure they are clearly labeled and that drivers know where they are supposed to wash out. By doing this, we can make sure that one of the biggest pollutants from construction sites does not reach our waterways. 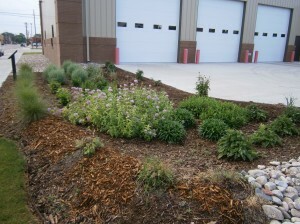 The planted area you see pictured below is a bioswale. A bioswale is a long, often linear depression in the ground that allows water to move from one location to another. It has gentle side slopes where plants can be grown to slow water enough to filter pollutants and allow more runoff to filter into the ground. This bioswale collects all the water from the roof of the library and directs it to the storm drain at the bottom of the swale. Roof runoff often carries many pollutants, such as leaf litter, bacteria and algae that grow in gutters, and bird droppings. 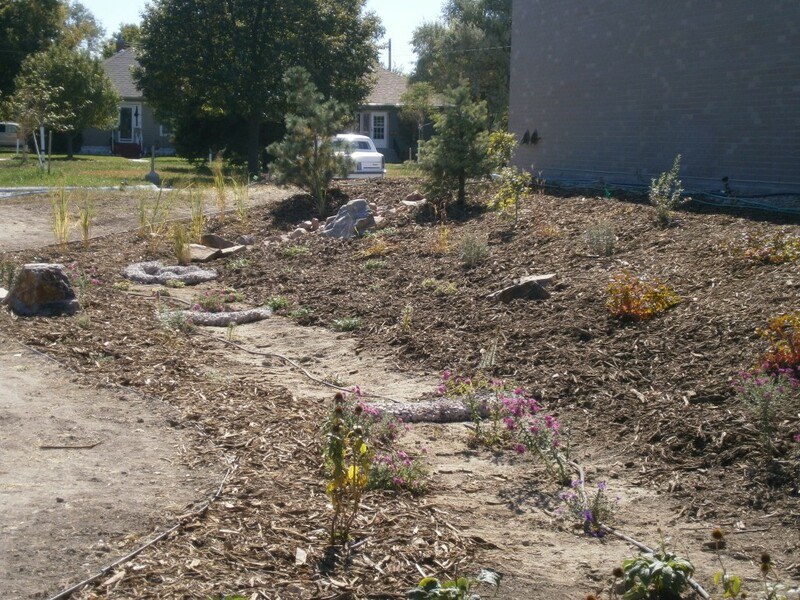 The plants in the bioswale will help remove these pollutants before the runoff enters the storm sewer system, where it travels directly to theNorth Platte River. This bioswale was the Eagle Scout project for Spencer Lake. Lake worked with the City of Scottsbluff to complete the project with help from members of Boy Scout Troop 13 and the UNL Master Gardeners. The project was designed by Amy Seiler and was funded in part with grant funds from the Greener Nebraska Towns Initiative and in part by the Lied Scottsbluff Public Library Foundation. The day of the installation, we had 29 volunteers work for a combined 100 hours. Scroll through our pictures below for more information on this project. See videos below for recent public service announcements about stormwater pollution, rain gardens, and cleaning up after pets. 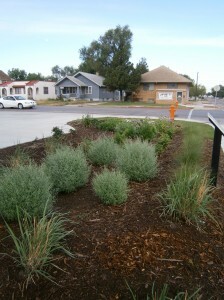 Here are some current pictures of our City’s first Rain Garden located at the corner of 19th Street and Avenue B. Thank you to Connie McDonnough and Breann Hort for your help with maintenance! Coneflowers and Liatris are starting to bloom as well!